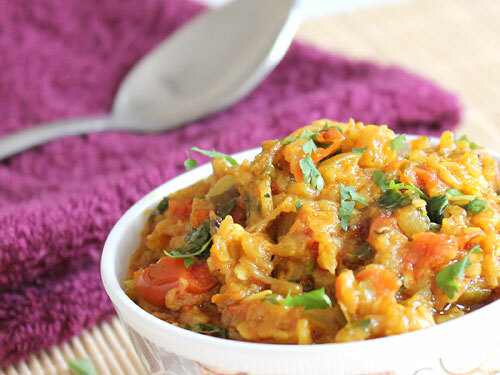 Baingan Bharta is a traditional Indian Curry particularly famous in rural India. Urban Indian who grew up eating this curry in their rural homes will swear by its heavenly taste and drive long distances to restaurants who prepare and serve it well. This authentic recipe uses cooked spices to make deliciously mild spicy baingan bharta. The ultimate taste of this dish lies in perfect selection of brinjals. Choose big round/ oval shaped brinjal which looks bigger in shape but lighter in weight for this recipe. Do not choose very hard brinjal. Slit the brinjal on each side a little using a knife or poke it at multiple places using a fork. This will provide a steam to escape from brinjal when it’s getting roasted. Apply some oil over the surface of brinjal using a brush. Place it on a burner and roast it on direct flame. 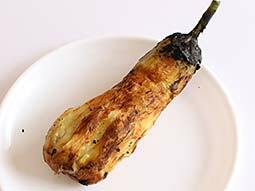 Keep the flame medium while roasting the brinjal. When the outer skin turns black and starts to separate from the inner layer, turn it to another side. 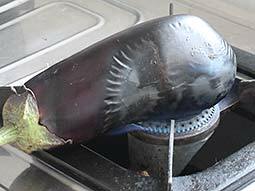 Keep turning the brinjal at regular intervals to cook it evenly. 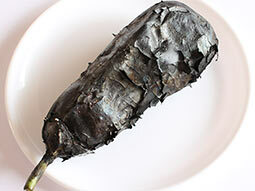 When the whole surface turns black and flaky and brinjal becomes soft, turn off the flame. Let it cool down for 5-10 minutes. Peel the charred skin. 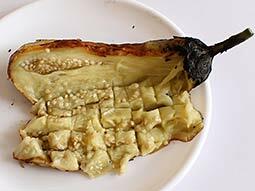 Mash the brinjal using a spatula or cut it with a knife into small pieces (as shown in the photo). Heat 2 tablespoons oil in a pan over medium flame. Add chopped onion and sauté until it turns light brown. 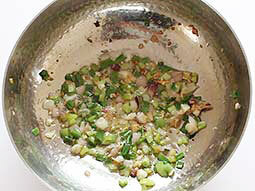 Add crushed ginger-garlic, green onion and chopped green chillies. Sauté it for a minute. 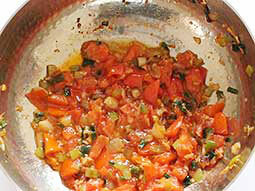 Add chopped tomatoes and salt (add salt only for tomatoes) and cook until tomatoes turn soft. Add turmeric powder and red chilli powder and mix well. Add mashed/chopped brinjal and salt. Mix well and cook for 5-6 minutes. Turn off the flame and garnish with coriander leaves. Baigan ka bharta is ready to serve. Green onion enhances the flavor, if it is not available just skip it. Add boiled green peas in step-7 for variation. You can also add the cumin seeds and asafoetida in the temepring. 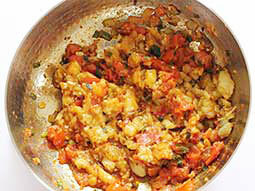 Taste: Flavorful taste of roasted brinjal with cooked vegetables and spices. Serving Ideas: Serve it with chappati or steamed rice. It tastes delicious with Bajara roti, curd, buttermilk, onion and jaggery in dinner as an authentic village meal. Quick, easy and tasty recepie. Nice recipe with easy understandable method.